We present a Lagrangian decomposition approach for the Knapsack Constrained Maximum Spanning Tree problem yielding upper bounds as well as heuristic solutions. This method is further combined with an evolutionary algorithm to a sequential hybrid approach. Thorough experimental investigations, including a comparison to a previously suggested simpler Lagrangian relaxation based method, document the advantages of our approach. 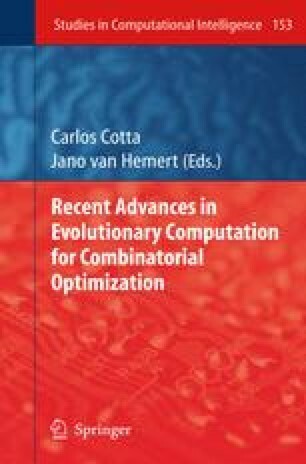 Most of the upper bounds derived by Lagrangian decomposition are optimal, and when additionally applying local search (LS) and combining it with the evolutionary algorithm, large and supposedly hard instances can be either solved to provable optimality or with a very small remaining gap in reasonable time.